Essay writers try to create a vivid picture so the readers can perfectly imagine what they convey in their texts. It is logic that descriptive essay as a genre allows a lot of creative freedom, which is necessary to engage all your narrative abilities in produce a truly picturesque description. In the end, the readers should have in their minds nearly the same picture that the author wishes to convey in his story. And if it is the case, the author’s mission is successful. Useful hints for writing a descriptive story are quite simple and often intuitive. They are directly related to the peculiarities of this sub-genre. One is that a good essay writer producing a descriptive piece needs to benefit from details. Thus, if, for example, you are tasked to describe your favorite dish, it would be useful for the essay if you, firstly, all the dish’s components. In doing so you describe all their properties and what they impart to the final dish. Reading about the mild pungency of red bell pepper and how it combines with tomatoes in your variant of stewed meat definitely revives the readers’ imagination. Secondly, you try to describe in detail all the stages of cooking. Such an element of your essay attracts the readers for practical reasons. Because it is nice for you as the essay writer if they feel that by reading your essay they will truly learn to cook the dish you are speaking about. The language that you use in this type of essay should be specially concise and clear and relevant to the reader’s own manner of speech. That is because if you try to make the readers experience your own feelings, the way of speaking and tone must not prevent them from doing so. Learn who your audience are and write as they usually speak. Engage the senses. Writer attains closer connection to the readers when the text appeals directly to their senses. Describe what the thing smelled like, what its taste was like and what familiar object it looked like. For the same purpose, you may use more expressive (maybe colloquial) word variants (like bizarre instead of strange), try to be familiar with the readers (bet certainly not too familiar) and invent other techniques with similar effect. But at the same time, in search of better expression, it’s very easy to let yourself led into a complete ramble of senses and emotions, which should certainly be avoided. Be organized and keep a sense of proportion. Now a few words about the organization and structure of a decent descriptive story. 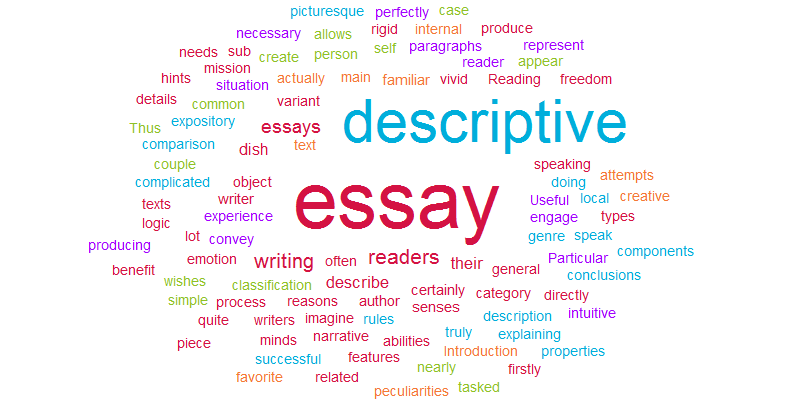 Being a category within the group of explorative essays, descriptive essay shares all their features, including in the construction of the text. Introduction in a descriptive gives a general characteristic of the object they you are going to make flourish in the main part. It is like introduction to the public. No particular strict rules apply. You even need not use the notorious “thesis statement”. Just explain what you speak about and make a smooth transition to the core paragraphs. The main paragraphs is the place where you are welcome to display your powerful narrative abilities. Tell the reader about your impression of the sunset in the small old town. What the medieval semi-ruined mural around it resembles you. How the local homemade wine smells and tastes. And don’t forget to mention the somewhat doubtful local tradition. Feel free and be a great master. In the conclusion… just make conclusions. Conclusions to your description… Hard to imagine. Overall, write good high quality descriptive and other kinds of essays. Learn the rules and take advantage of them where they are really advantageous. And show your individuality where possible.